Industrial lighting leader, Larson Electronics LLC, has just announced the release of a new 300 watt explosion proof LED light tower with a quadpod mount, capable of illuminating an area up to 14,500 square feet. This adjustable Cree LED light tower is designed for portability and durable operation in harsh, demanding conditions such as emergency services, mining, construction, marine, and industrial operations. This light towers ability to collapse, be taken apart completely, and be wheeled around, makes it a great addition to any demanding condition where explosion proof lighting sources are required. The EPL-QP-2X150RT-300 is a Division 1 Class 1 explosion proof quadpod mounted LED lighting system ,with an output of 35,000 lumens of light projected over 14,500 square feet of work area. 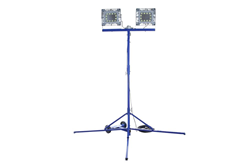 This portable LED light tower features two removable heads, each containing 12 12.5 watt LEDs producing 116.67 lumens. Paired with high purity optics, these light heads produce 17,500 lumens in a flood beam pattern, drawing only 1.25 amps on 120V for extremely efficient and powerful illumination. This LED light tower is perfect for replacing metal halide floodlights that are too fragile and run hot. With impressive illumination capabilities comes equally impressive functionality. This portable LED light is mounted on a four-legged, non-sparking aluminum quadpod. Not only is the tower adjustable from seven feet to twelve feet, but it can be completely taken apart for storage and transportation. The quadpod includes solid wheels for easy movement from one area of the workspace to another. Additionally, this explosion proof LED is equipped with 300 feet of 12/3 chemical and abrasion resistant SOOW cord, fitted with an explosion proof cord cap, making connections to explosion proof outlets simple.